The Cushioned Ball Mount by Convert-A-Ball acts as a shock absorber. Protects the towing vehicle's driveline, hitch assembly and trailer contents. Easy to install. Proven effective in reducing bounce and rhythmic vibrations. 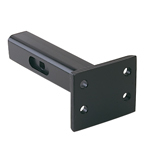 For use with underframe receiver hitch with a 2" square socket. Class 4, V-5 SAFE! NOTE: The AMSC Series is available in 10" and 12" drops (not shown) and may be used as a drop or a rise. The shanks are 2" x 2" tube with 1/4" wall thickness. Shank hole is 1" diameter. The hitch pin hole receives a standard 5/8" hitch pin. Maximum trailer weight of 10,000 lbs and max tongue weight of 2,000 lbs. Rated Class 4, V-5. Meets SAE Standard J-684. A Cushioned Ball Mount for the 2-1/2" Receiver. 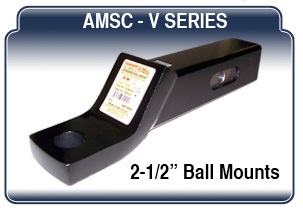 The AMSC-V features an 18,000 lb Maximum GVW and 2,000 lb Max Tongue Weight. 1" Thick Tongue with a 1-1/4" hole and 1/4" Thick Tube Walls . 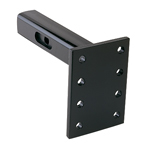 These heavy duty ball mounts are available standard in 2", 4" or 6" drops which can be flipped over for use as a rise. The PH-2 - Cushioned Pintle Hitch features a Nickel-Plated 3-ball Convert-A-Ball set and a pintle sleeve. For use in a standard 2” receiver hitch. The PH-2 will fit the blind hole receivers as well as the regular open receiver. 16,000 lb gross weight and 800 lb maximum tongue weight. The PH-1 - Bolt-on Pintle Hitch features a Stainless Steel 3-ball Convert-A-Ball set and a pintle sleeve. 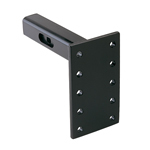 Has a standard bolt-on pattern for attaching to a flat surface or one of the AMPC cushioned adapters (see below). The AMPC Series is a cushioned adapter compatible with the PH-1 as well as several aftermarket mounts.They may be used as drops or risers. Shanks are a 2" x 2" tube with 1/4" wall thickness. The hitch pin hole receives a standard pin. Uses 4 grade 8-9/16 18-UNF bolts. Be sure they are long enough for mounting purposes. Maximum trailer weight of 10,000 lbs and max tongue weight of 2000 lbs. Rated Class 4 V-5. Meets SAE Standard J684.